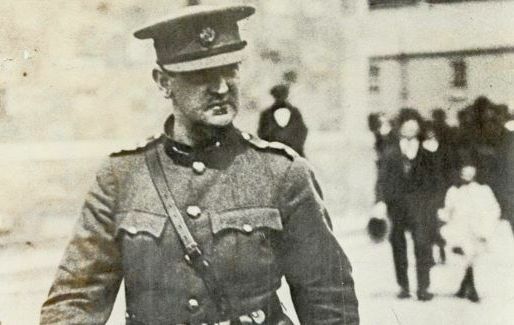 A series of improvements are being planned for the ambush site in mid-Cork where Michael Collins was shot dead by Anti-Treaty Forces on August 22, 1922. Cork County Council’s architects department is planning to upgrade the Béal na Bláth site next year as part of the centenary celebrations of the 1916 Rising. Conor Nelligan, the council’s heritage officer, said the extent of the upgrade would depend on funding, but at this stage it looks as though the council will carry out road improvement works; landscaping; put up interpretive boards; and generally freshen up the area. The road will be realigned, providing extra safety and additional parking opportunities. Mr Neligan said there were no plans at this stage to build an interpretive centre on the site, especially as the council is preparing to open a museum in Clonakilty to commemorate the War of Independence hero. It had been expected that museum — which is in a three-story house in Emmet Square, close to where Collins once lived — would open late this year. But Mr Neligan said it now seemed likely it would be next year. The centre will display a large amount of Collins memorabilia and visitors to the centre will be able to view footage on screens, bringing his contribution to local and national history to life. It is expected to be a big draw for tourists. 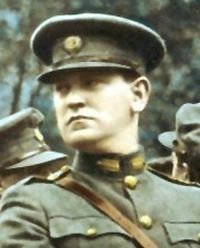 As part of the council- organised 1916 centenary commemorations, a new play Michael Collins, with the working title The Big Fella, is expected to be launched by GDI Productions. Meanwhile, in Kilmurry — which is just two miles from Béal na Bláth — the locals are preparing a number of events for next year, which will include officially opening a museum on Easter Sunday. It will have a strong focus on the War of Independence including artifacts connected to Béal na Bláth and the Kilmichael ambush. The latter took place in November 1920 when 17 RIC/Auxiliaries were killed in a controversial attack led by IRA Cork No 3 Brigade, commanded by Tom Barry. The Kilmurry Historical and Archaeological Association is also planning to provide tours of the area’s War of Independence and Civil War sites and, in association with Ballinhassig Historical Society, carry out a re-enactment of a Volunteer march through the village. Both these events are pencilled in for March 27. Meanwhile, Dúchas Clonakilty Heritage is organising an open meeting at 8.30pm on Wednesday to examine how Clonakilty can commemorate the Easter Rising. The meeting will be held at the former Boys’ National School in the town, (now the Parish Centre), where three past pupils who participated in the Rising itself in Dublin were taught. Michael Collins, Con O’Donovan, and Seán Hurley, (the only Corkman killed during Easter Week in the fighting in Dublin), were all pupils at the school before they left as young teenagers. All local organisations, schools and groups, as well as interested individuals, are encouraged to attend the open meeting. Buttons found on Michael Collins on the day he died. BRASS buttons found in Michael Collins's pocket on the day he died are to be sold at auction among a collection of Irish-themed curiosities. 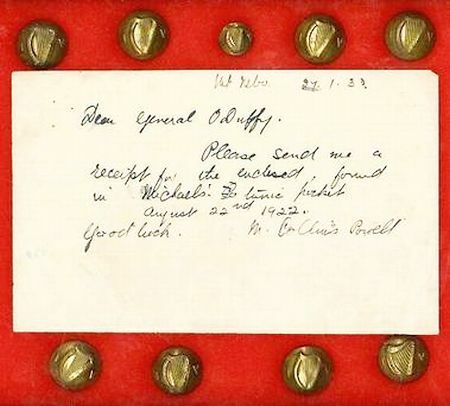 The buttons, which are expected to fetch between €1,500 and €2,000, come with a signed note to General Eoin O'Duffy from Michael Collins's sister, Margaret Collins Powell. The note reads: "Please send me a receipt for the enclosed, found in Michael's tunic pocket, August 22, 1922." This was the day of the assassination of Collins in Beal na Blath, Co Cork. It comes as part of a large collection of items which belonged to the former IRA Chief of Staff O'Duffy, including the last truce that O'Duffy negotiated with the Anti-Treaty side in 1922 and other personal items. However, all of O'Duffy's belongings in the collection nearly found their way to the dump, as the current owner of his estate lives in Norway and didn't originally realise their significance. The auction, entitled 'A Gathering of Things Irish Sale' is on July 23 at the Clyde Court Hotel, Ballsbridge at 10.30am. The revolutionary leader Michael Collins has been airbrushed out of history, it was claimed yesterday. 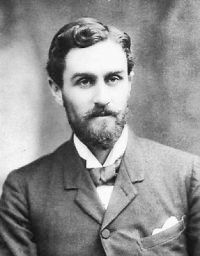 A new society, Collins 22, has been set up to publicise the achievements of the west Cork native on the 115th anniversary of his birth on October 16, 1890. Fine Gael MEP Jim Higgins spoke at the launch of the society. 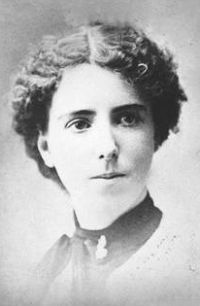 He said not enough recognition had been given to Collins’ role as a leader in the War of Independence. “We’re here to recognise the fact that a man of dedication, vision and unquestionable leadership qualities has been airbrushed from Irish history for far too long,” he said. He said Collins had built up a complex network of spies that had penetrated Dublin Castle, the nerve centre of British rule in Ireland, and had used innovative military tactics during the war. “He recognised that you couldn’t get rid of the British with conventional warfare methods. He devised a whole new structure, the ambush guerrilla tactics,” Mr Higgins said. Collins had been head of the provisional government when he was killed in an ambush in Béal na Bláth in Cork in 1922 during the Civil War. Mr Higgins said the tantalising question of what would have happened if Collins had lived could never be easily answered. The MEP for the Northwest constituency said he believed that Collins would have not ignored the discrimination against nationalists in the North and would have put a process in train that would have prevented the outbreak of the Troubles. 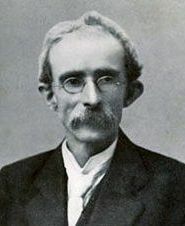 Although Collins was never a member of Fine Gael, the party claims a link with him because of his association with the members of the provisional government who went on to form Cumann na nGaedheal and later Fine Gael. Fine Gael members accounted for five of the seven speakers at the Collins 22 launch in the historic round room of the Mansion House, where the first Dáil met in 1921. They included party leader Enda Kenny and former justice minister Nora Owen, a grandniece of Michael Collins. The former MEP Mary Banotti, another grandniece, also attended. He said the society would campaign to put Michael Collins at the centre of Irish history. “All we want to do is have the man honoured. America honoured George Washington. 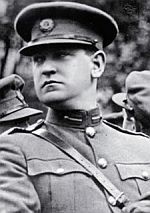 We became independent from England in 1921 when they signed the treaty, so why isn’t there a statue of Michael Collins outside the Dáil?” he asked. A statue of Michael Collins has been erected in Clonakilty. His life was the subject of a Neil Jordan film in 1996. This page was loaded Apr 22nd 2019, 10:50 pm GMT.